Well, two things. There’s been way too much speculation about it from my accounts. I want to say two things: One is that, Brian and I had a cordial relationship. You know, it was tricky, because he succeeded me and I had my own strong feelings about how things should be done, but I never interfered with it. And I would make suggestions from time to time. But, right, he just had finished his tenth anniversary and he wrote me a wonderful note about having the job. And I really admire his family a lot. Having said all that, this is a really, really serious case, obviously. There is a process underway. And the important thing is that the process is very carefully constructed. And we owe it to everybody, including Brian and his family, and certainly the people who work at NBC News and risk their lives every day and to the integrity of what NBC News has stood for, for all these years. Let the process play out. To hear what the final conclusions are, and then deal with it at that point. 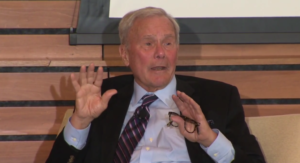 Even though it’s been more than 10 years since Brokaw gave up the anchor chair to Williams, he is still an eminence grise at the network. So it shouldn’t surprise anyone if NBC News’ investigation of Williams will require Brokaw’s stamp of approval before being released to the public.